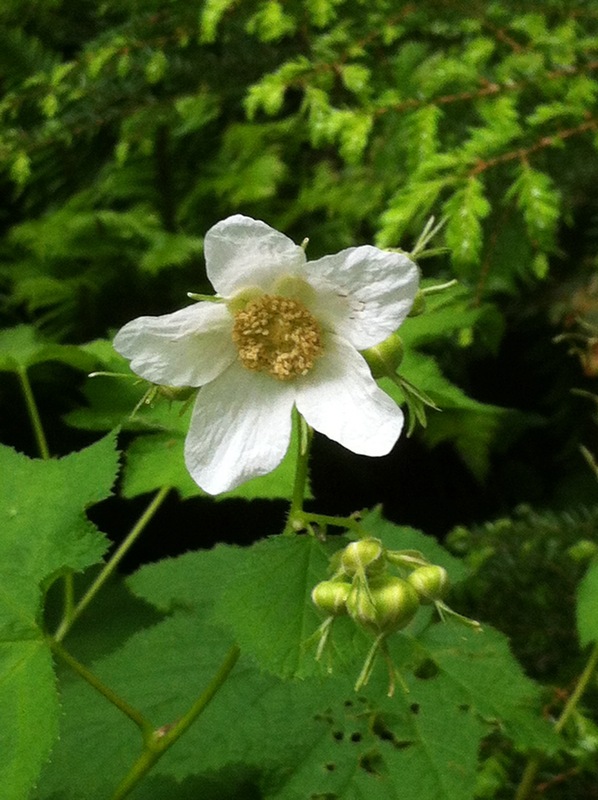 Thimble Berry blossom in the woods. Oh happy May. Saturday Joe and I went for a delightful walk on an old logging road into the state forest behind Alderbrook. Immersing ourselves in bird song and the verdant growth of unfurling spring leaves. We spoke of what nurtures, of what fills up our batteries, and how to prioritize joyful activities. Both of us have a longstanding bad habit- of trying to cram way too much into our life, which has historically caused us to neglect down time. Obviously we both have a great work ethic, it is just that I routinely have delusions of what I can get done in a given timeframe. I am beset by ideas too numerous to implement. A result of this is that for most of my life I have created a state of chronic stress exasperated by the list of thing not yet done. From taxes, to walks with friends. Our house has been a mess for years- not because we were watching too many movies- but because we were expecting ourselves to get more done each day than was possible. In that state with TO DO lists ten miles long, I used to routinely downgrade self care and joy on my priority scale. Not that we had no fun or joy- honestly I can usually have fun doing just about anything. But herein lays the rub- I have a really difficult time doing “Nothing.” and doing nothing is actually a really really important thing to do- or not do. It is in the state of completely letting go of action that your body can relax and work on maintenance and repair. It is from that quiet space that it is possible to do the creative and spiritual work that nurtures and sustains us. Time management is less about being more firmly structured and organized, and more about saying NO effectively and having the discipline to create space to do nothing on a regular basis. Because saying NO gives you room to say yes and doing nothing gives you time to have clarity. My pattern has been that whenever I am super focused on a task- I very easily defer basic self care. Part of this ongoing transformation work I am engaged in now is to observe when I start to wobble towards the abyss of too much busyness. To observe the warning signs of having said more yeses than I can handle. In reentering the work force post treatment it has become easier to notice what my tipping points are. The contrast between a year of healing and intense self care with employment showcases things I used to ignore. In short I am getting more accurate calibration to measure how close I am to my individual saturation point. It is a great gift that my work is basically flex time, and not too many hours because it gives me space to breathe and reflect. What constitutes the straws that break my back? What are the warning signs of impending stress for me? Some I have known about for a long time. Years ago my friend Audrey was regularily spending the night at our house every few weeks when she traveled to town for for work. Audrey observed that she always could tell how stressed I was just by looking at my Altar. 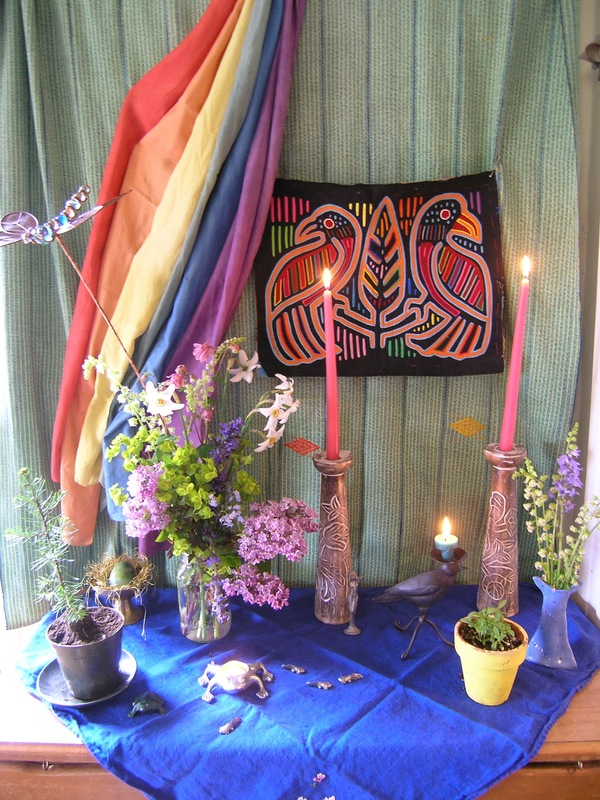 A Cluttered Altar indicating overwhelm and a Fresh Altar indicating happier times. I have now identified several other symptoms of nearing the saturation point- for instance, Laundry. Mundane as it seems, when the Laundry gets away from me it is a symptom that I do not have enough slack in my life. I realized this week that writing is another indicator of health for me- enough time and space to write only happens when my life is a bit slower. Writing has been something I have enjoyed doing my entire life. Giving myself space in my schedule to write has been one of the greatest gifts to come out of my year of cancering. With my return to work in January I have devoted less and less time to it. As May opens before me I am feeling resolute to prioritize more space for it again. The physical symptoms that I carefully indexed during my years of fatigue prior to diagnosis are also still present in my life. A too busy week brings back the hacking cough, and my sense of time becomes distorted. In working on self acceptance I am increasingly able to just observe these things- with less compulsion to talk myself out of them. One of the things I have been given from my two beautiful boys is the awareness that everyone has a different point of overstimulation and overwhelm- and that it can change day to day. Just like you can dissolve more sugar in hot water than cold, our lives can absorb a varying amounts of input depending on what is going on. Because our culture, and specifically the culture of my family of origins, places a negative value on being “Too Sensitive” I have cultivated the ability to negate the signals my body sends me when I am nearing overwhelm. To tough it out, and get on with It. Whatever “It” is. It is definitely a new occurrence for me to notice and accept how close to my saturation point I am. It makes me wonder how many others are pushing themselves past their most effective way of being, because they are judging themselves harshly for being overwhelmed or overstimulated. Comparing themselves to others and weaving stories about how much more easily others are juggling their lives. To observe that we have different natures, and that as a result we have different saturation points, is to validate that we are different, and can process different amounts of input. It has nothing to do with being a hard enough worker- or a good enough friend. Recognizing when the cocktail life has just served you is going to be too much, is the kind of awareness we all must cultivate. Because it is neither good nor bad it just is. Last week I said no to two opportunities that I would have loved to have done- not because they were not each worth doing- but because I recognized in time that they were too much of a good thing for me at this moment. I am finally learning to cultivate discretion rather than toughness. Even the little bit of meditation that I am practicing has been noticeably helping me to be more disciplined about limiting what I say yes to. 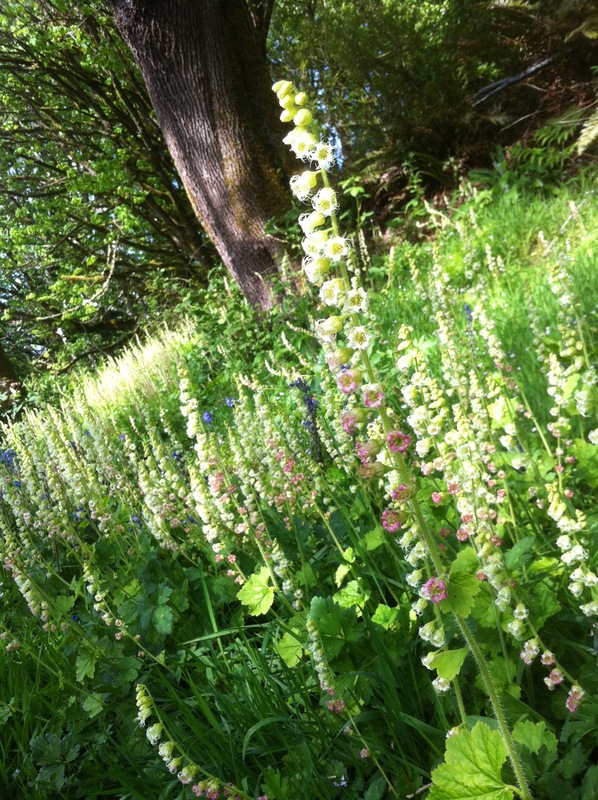 Fringe cup blooming on a hillside near Alderbrook beach. Overwhelmed, over busy and stressed people do not make good decisions or take adequate care of themselves. Saying no to things is the only way to remain balanced and healthy. We live in an incredibly abundant world, it is bursting at the seams with wonderful things to do and experience. Saying no judiciously gives us the space we need to choose what we most want to say Yes to. This new world I am walking into, in which I take time to go for hikes with my husband inhaling the sweet smells of trees and fringe cup flowers- where I prioritize time to do nothing and time to write, is a fragile beautiful thing. May the wonders of spring bring to you Joy, and the time to savor it. A most beautiful and timely message. Thank you, my friend. Loved your analogy with the dissolving of sugar and the cocktail offered by life. Before my diagnosis I had already been working hard to remove stress from my life and to engage more with the things that bring me comfort and peace. After treatment I feel even more committed to this approach and your post captures the essence of this balancing act, beautifully. Thank you.